Conner Prairie will travel back 150 years to the beginning of the US Civil War, bringing it back to Indiana. Re-enactors from across the Midwest will bring the Civil War to life, turning the living history park into Union and Confederate camps. 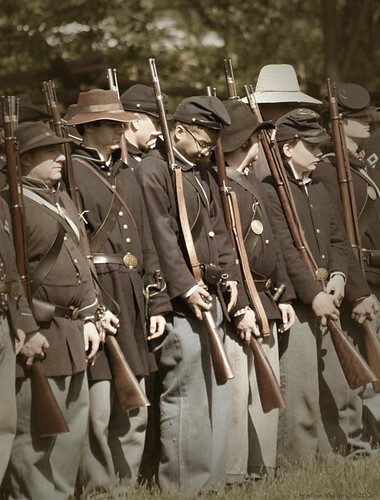 The Civil War Days run on Saturday, May 21 (10 am – 5 pm), and Sunday, May 22 (11 am – 5 pm). Because this is the 150th anniversary of the War Between States, Conner Prairie will have several special programs to highlight the stories of the Indiana regiments that fought in the civil war. The re-enactors will be available to discuss their uniforms, equipment, campaigns, and the battles they fought. They will discuss the soldier’s lives from both sides of the Mason-Dixon line. Guests can even speak with President Abraham Lincoln, Confederate and Union soldiers, help doctors at a field hospital, march with the infantry, and even watch a battle between the two armies each day at 2 pm. Explore telegraph equipment utilized to disseminate messages during the Civil War. Talk with a soldier from the 28th U.S. Colored Troops (offered at Noon each day). Learn about the role of naval weapon technology during the Civil War. View Civil War fashions and listen to Civil War camp music. Vendors will have booths and tents available, offering toy soldiers, collectibles, Civil War uniforms, civilian clothing, re-enacting supplies, and period-related books and toys. Tickets are $14 for adults, $13 for seniors (65 and older), $9 for children (ages 2 – 12). Conner Prairie members are free, as are all past and present military members, and half-price for immediate family members. In honor of Armed Forces Day, Conner Prairie will provide free general admission to all past and present military and half-price admission to immediate family members on both May 21 and 22.